Jodie and I just flew into Hong Kong this morning for a 15 day trip, 3 of them in Hong Kong and 12 in Guangzhou. We'll be catching up with our suppliers and working with Vanessa from our Guangzhou office while we're over here. There is lots on the agenda including new shoe styles, new materials including silks for wedding shoes, new shoe boxes and shoe bags and we'll be continuing to improve on our processes like photography and the arrangements we have with our shipping suppliers. In addition to that there will be some time to catch up with friends in Hong Kong and enjoy the great food in China. We're looking forward to a fun and busy trip! I absolutely love that picture! 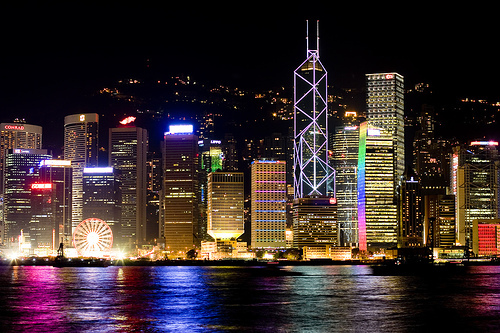 I have always wanted to go to Hong Kong, it just seems so beautiful. Do you own a shoe store? Whats your site? Thanks Patty, it's an amazing photo isn't it.